Morawiecki at his best. PM Morawiecki directly answers a set-up attack from a contributing writer for the “anti-Poland” New York Times, who incorrectly and shamelessly implies that Poland collaborated with Nazi Germany. Obviously, this media attack – accompanied with audience applause – was a planned theatre. 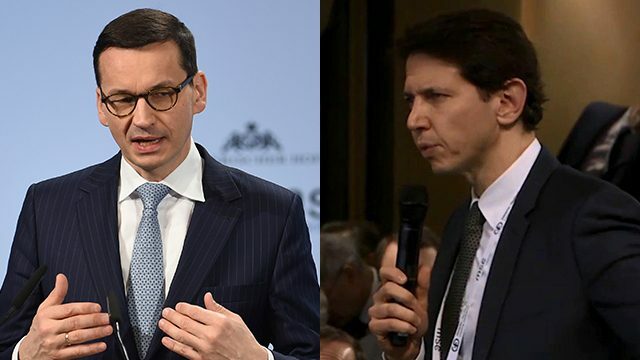 However, while the opponents of Poland resort to smears, Morawiecki prefers to defend his nation by calmly debating the facts. Unfortunately, I witnessed similar bitter and nasty attacks from some of these same groups during the run-up to the 2003 invasion of Iraq. Many writers who bravely opposed the Iraq war – correctly pointing out the negative consequences of “regime change” – were falsely accused of “anti-Semitism” by some of the same leaders and organizations, including the NewYork Times, who now slander Poland. The government of Israel, among others, was one of the biggest proponents of the US invasion. As we now know, the Iraqi War was a colossal “neocon” catastrophe which opened the door for Islamic terrorism and greatly contributed to the destabilization of the Middle East. Poland should ignore the noise and continue to defend itself.